me and him: mondays are hard. i think it's the high intake of sugar sundays bring. so please excuse me while i recover. oh. and by the way. i love spring time. i love tulips. i love mothers (happy m-day!). i love the fresh air and much anticipated sunshine. but i do not love the watery eyes and sneasy nose. time to go get some more Zyrtec D.
try to use it to make drugs or something like that. 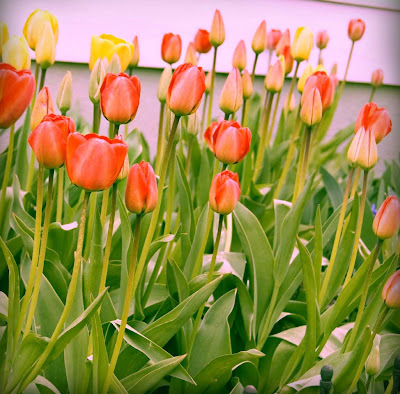 those tulips are almost as pretty as those gerber daisies... almost. touché to the sugar high....I go comatose from it at about 10pm every sunday night. I was thinking about tulips the other day, missing them. And then I cried a little bit. There are some beautiful tullips around, that's for sure. Sorry about the allergies. I used to think I gave those to you girls, but it seems like lots of people have it, so maybe it just comes with the territory.